Rob Kinsey is an artist with a passion for the sport of motocross, defining himself on his website as ‘motocross racer, fan and award-winning artist’. Art and sport have been important to Rob for many years. He qualified as a technical illustrator in the 1970’s and his artwork has developed in parallel with his participation in motocross. He competed in the British Motocross Championships from 1977 to 1981 and still rides in Vintage Motocross events. He specialises in painting with acrylic on canvas and produces high quality prints using the Giclée process, which ensures that the colours do not fade over time. 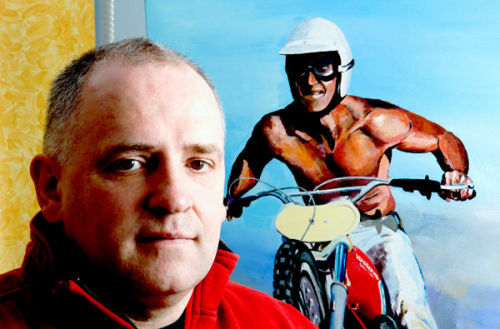 Photo: Rob Kinsey with one of his motocross paintings. “They are all painted with a passion,” says Rob, and he combines his passions for art and motocross with business acumen. He sells pen and ink drawings, prints and original artworks through his e-commerce website to a world-wide customer base of riders, fans and motocross businesses. To help make his creative enterprise even more successful, Rob attended a business development course close to his home in Derbyshire, England. The ‘Focusing Creativity’ workshops helped Rob and other creative entrepreneurs to devise business strategies which combine their creative talents with smart business thinking. “I went on the course feeling that I should diversify my range of artwork away from just motocross because I felt vulnerable by having all my eggs in one basket,” said Rob. However, by the end of the course, after having considered a range of factors such as his competitive advantage, market segmentation and pricing strategies, Rob decided that his best option was to play to his strengths and focus on motocross art. “The course encouraged me to focus on what I’m passionate about and to capitalise on my position in the world of motocross” said Rob. “The message I came away with was ‘Believe in yourself and don’t worry about only working in a niche market – simply become the best motocross artist in the world!’ from the aptly named Focusing Creativity course” said Rob. Despite being a one-person enterprise, Rob’s business strategy is similar to that of some of the biggest corporations. Jim Collins identified that the most consistently successful companies use the ‘Hedgehog Concept’. (The hedgehog is supremely good at one defensive position, and it survives by sticking to its winning strategy.) Businesses using the Hedgehog Strategy have identified the one thing at which they can be world-beaters. This results from an objective understanding of what you can be best in the world at combined with the thing you are deeply passionate about. This focused strategy worked. Within a year he was appointed as the ‘Official Artist to the 2007 Motocross de Nations’ in Maryland, USA. This accolade will give him the opportunity to exhibit and sell his works of art in the VIP and Press buildings at the event, which is the ideal marketplace at the very heart of this international sport. 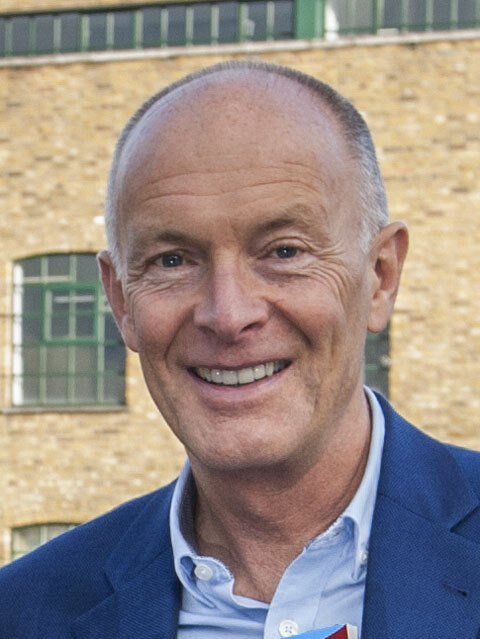 Rob Kinsey has achieved world-class status by focusing on his niche market, concentrating on his specialist creativity and being driven by his artistic passion – combined with a clear business focus. Let me know about other creative entrepreneurs who have focused on a specialist niche to achieve world-beating success.